Alaska Native News Jul 5, 2017. 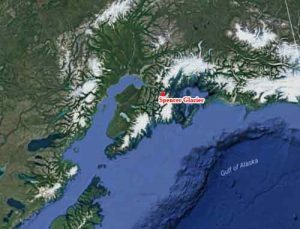 The Alaska Rescue Coordination Center was called out to Spencer Glacier in Portage on Monday, following a notification to Alaska State Troopers that a person had suffered injuries in a fall at 1:39 pm. The call was made to the troopers reporting that a 34-year-old Pennsylvania woman, identified as Julia O’Neil, had fallen 20 feet into a cravasse on the glacier and suffered injuries. The 21oth and the 212th Rescue Squadrons dispatched to the glacie, where they hoisted the injured woman and transported her to the Providence Alaska Medical Center for treatment of non-life-threatening injuries.